For more information about The Cow Ponies, or to book us for a gig, send a message here and we’ll get back to you right away. Cleveland got three inches of snow yesterday, but spring is sho-nuff in the air and all around here in Milwaukee. 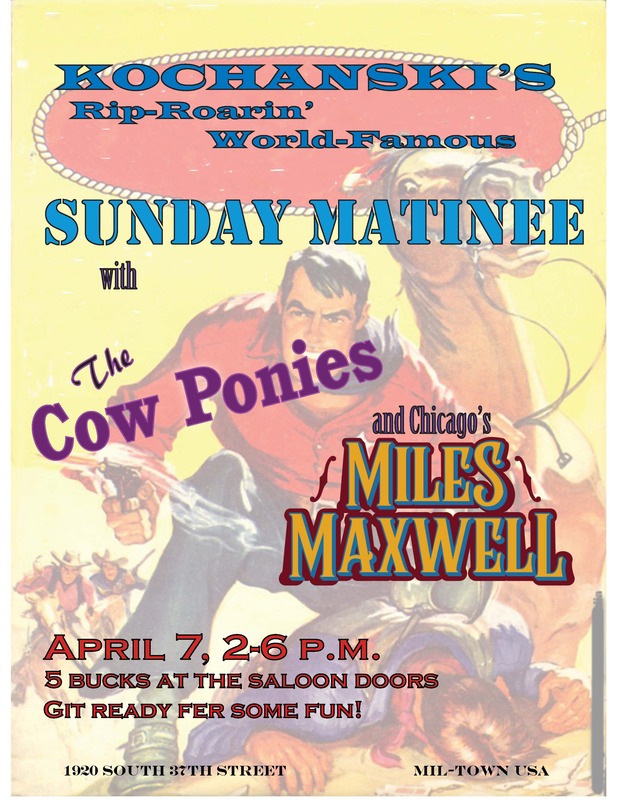 Perfect time for a Sunday Matinee at Kochanski’s Concertina Beer Hall! At this Sunday’s live music matinee (get ready for some day drinkin’), we’re pairing up with new friends Miles Maxwell, who are coming up I-94 from Chicago to spend the first half of the afternoon (2-4 p.m.) playing their brand of blues and alt-country (check out their sound on Spotify). The band’s first CD, Red Ghost, is available on their website. Until then, loves, we hope to see you at Kochanski’s. Only 5 bucks to get in. Come on in and help us give Miles Maxwell a big ole Mil-town welcome! We know we always say we’re excited about shows and honored to be playing with musicians. But it’s true, and this time is no different. 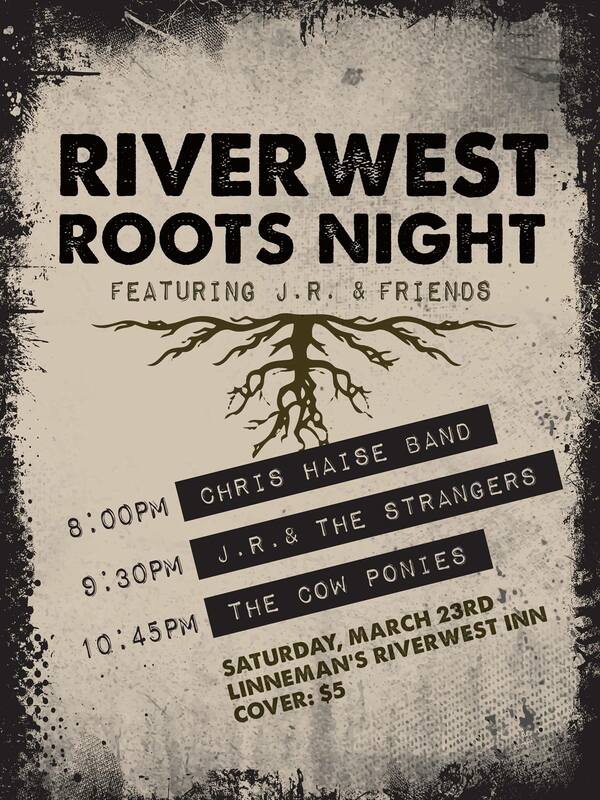 Linneman’s Riverwest Inn has been good to us, we’ve played with Chris Haise before (via Paladino), and R.J. Neale of J.R. & The Strangers has been a dream to work with, and it all comes together Saturday, March 23, when we three play at what we hope becomes the Riverwest Roots Night series. Join us for a genre-bending roots music party! Winding down a road of outlaw country, electric folk and blues, J.R. & The Strangers has been rocking southeast Wisconsin since November 2018. The band gallops along thanks to singer-songwriters Justin Jagler and R.J. Neale, lead guitarist Jim Richie and drummer Jake Stanzer. $5 cover. Show at 8 p.m. See the poster below for who plays when. Hope to see you there, loves! The first time we played Anodyne (224 W Bruce Street, in Milwaukee’s Walker’s Point neighborhood) was the weekend of the Harley-Davidson 115th Anniversary. Alex Ballard & Sugarfoot were on the bill with us, we had a devout crowd, and the Anodyne folks were a dream to work with — especially their very talented sound man Tim. 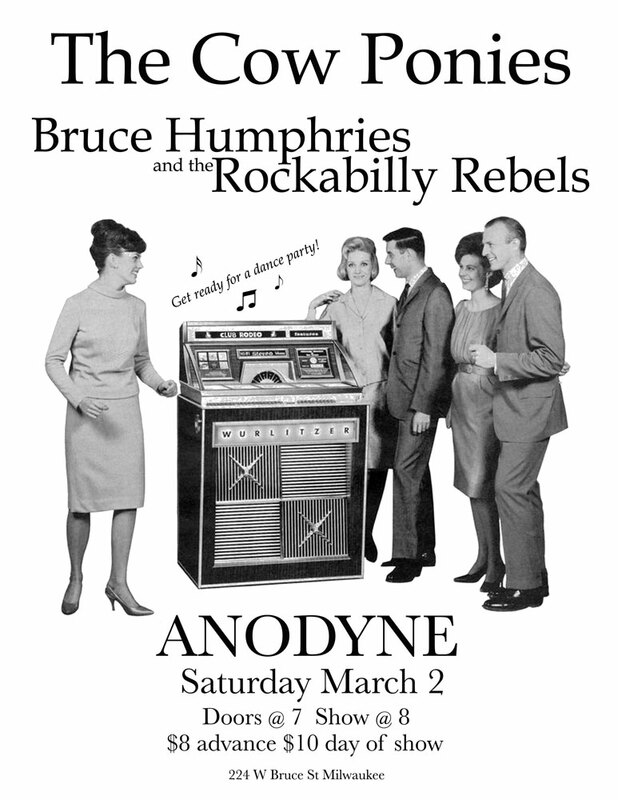 We’re back at the beautiful venue once agin, this time with friends Bruce Humphries and The Rockabilly Rebels, on Saturday, March 3. Tickets are $8 in advance and $10 day of show. 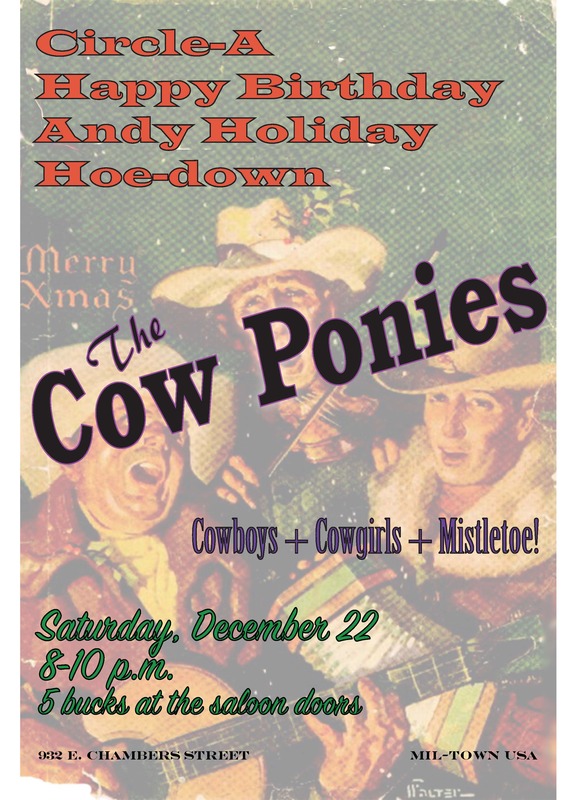 The Cow Ponies’ll play first (8:15-9:45 p.m.) and Bruce and The Rebels will close the show (10-11:45 p.m.). Doors open at 7 p.m. so come early and get yourself a seat plus something good to eat and drink (adult beverages available). The coffeehouse-by-day turns nightclub-by-night, y’all…trust us on this. Lookin’ forward to seein’ you on the 2nd! Mike has recently performed with Semi-Twang and The Delta Routine, and he and the band Yipes are currently on tour (they’ll be at Shank Hall in Milwaukee this Saturday, Feb. 16). We love and adore Mike (much respect) and are really happy to be working with him on this new project. Happy New Year from The Cow Ponies! We just celebrated our third anniversary and we’re kickin’ our fourth year things off fresh as the featured band at Amplified Artist Sessions at Saloon on Calhoun (17000 W. Capitol Drive, Brookfield, WI)) Thursday, January 10. Show starts at 7 p.m. with singer-songwriters in the round: Jay Matthes, Raine, and John & Brent from Tangled Lines will take turns playing you their music and then telling you what inspires their writing. Artists in the Round runs until about 8:30. 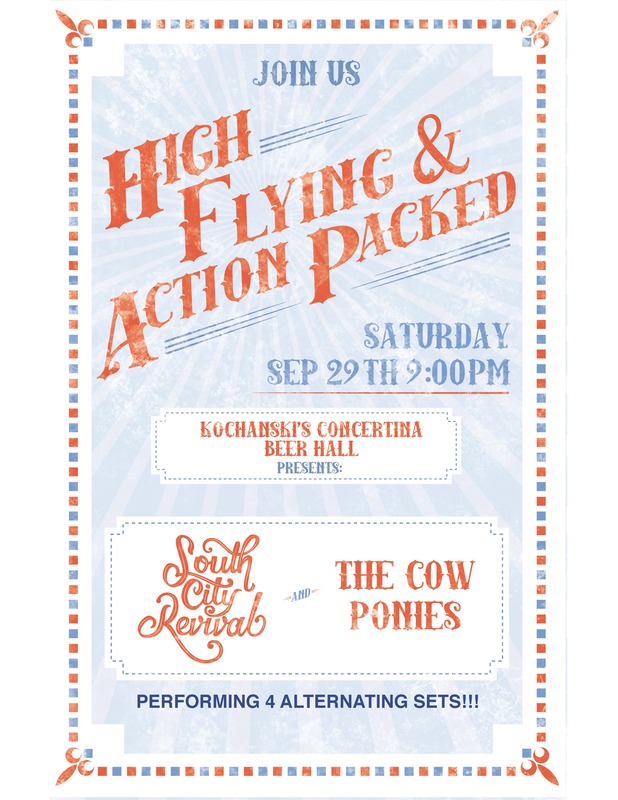 The Cow Ponies take the stage at 9 and we’ll be playing our originals for you for an hour straight. Most of you know by now that we ain’t that tame, so plan your cockles being good and warmed on a cold winter’s night. Saloon on Calhoun is the 2018 Wisconsin Area Music Industry (WAMI) Award Winner for “Best Venue.” Great food and drink menu, great stage, lotsa space. Get you sumthin good to eat, kick back, and take in some great live music. John & Robin performed as Artists in the Round back in March 2018 and it was a blast. Amplified Artist Sessions at Saloon on Calhoun is free and open to the public. Thank you for supporting live local music! Well, y’all, Andy’s birthday is the day after Christmas. Robin’s was the 12th. Keith got his ole nasty Popeye arm sewn back together, and he’s back workin’ those pedal steel muscles again. And The Cow Ponies had a great 2018! We couldn’t have done it without all of you who nominated us, voted for us, wrote about us, played us on the radio, invited us to play in your studios, booked us for shows and festivals, invited us to perform with them — and who came to see and listen and dance at our live shows! These are all the reasons we’re havin’ us a big-ole party at the venue we played at for the very first time we played out as a band: the fabulous Circle-A Café, 932 E. Chambers Street in the Riverwest neighborhood of Milwaukee. We’ll play 8-10 p.m., with a break somewhere in the middle. We’ll play all the danceable favorites, at least one punk rendition of a Christmas song, and, as we like to say in Wisconsin, we’ll be layin’ a couple-three new tunes we’re in the process of working on. Think of yourself as part of a rosy-cheeked focus group with alcohol and party favors. Only 5 bucks gets ya in. Come on down! We’d love to see your fine selves and give ya a big ole hug! Right after our show with South City Revival at the tail-end of September, our pedal steel player Keith went in to have surgery on his crazy Popeye arm (a couple-a torn muscles), giving us much-needed time for a break after a crazy-busy summer to rest, relax, and learn some new originals, along with some cool covers. Keith won’t be able to join us at Twisted Path Distillery this Friday night — his arm’s still in a sling — but we’ve set up a real nice show with them that runs 8 to 10 p.m. The best part: Alex Ballard is opening with an acoustic set, and H will be in tow too. 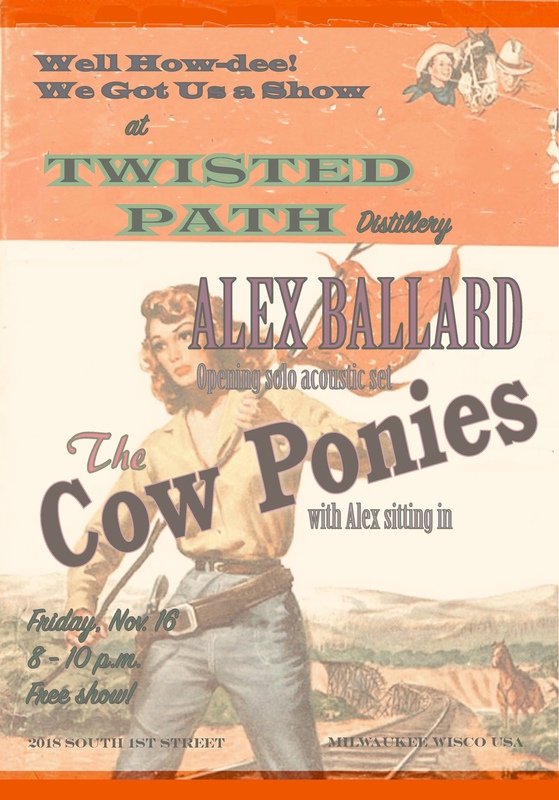 Then, because we won’t have Keith, Alex’ll be sittin’ in with The Cow Ponies on guitar and Lord knows what else. Come join us — there’s no cover, Twisted Path is in a way-hip-and-cool space on South 1st Street (The Lincoln Warehouse, 2018 S.1st St, in the Bay View neighborhood of Milwaukee), and they make a variety of organic spirits: vodka, vodka, rum, rum (yes, two different kinds apiece), gin, whiskey, liqueurs, cocktails, cocktails, and cocktails. 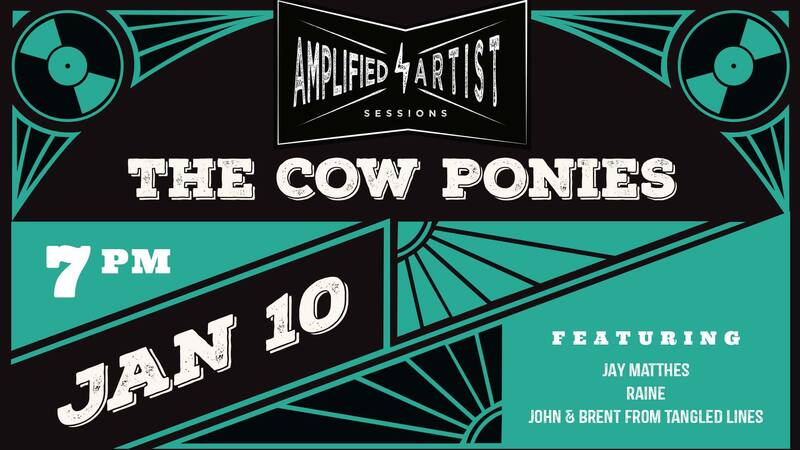 Cow Ponies founder John Graham’ll be right at home, and drummer Andy Stilin’ll be wearin’ his velvet smoking jacket! Lookin’ forward to seein’ all y’all for a lovely, lovely night! Check out how swank Twisted Path is. We can’t believe we’re saying this, but dang, we’re looking forward to playing an indoor show, and at an old friend’s to boot: Kochanski’s Concertina Beer Hall. It’s been a hot one in Mil-town, y’all. We felt the full force of those record-breaking heat waves that affected many of you around the country too. We’ve played at Kochanski’s a bunch-a times, but we haven’t been there since June when we played at Polish Pile-Up. This Saturday night, we’re playing with new friends comin’ up from Chicago: South City Revival, purveyors of American music who, according to Shepherd Express, play “rootsy rock ‘n roll and and alt-country in bluesy licks and weepy pedal steel guitar.” Right up our alley. It’ll be a good opportunity to see two pedal steels in one place. A great way to celebrate the end of summer and the beginning of a beautiful fall. The best place for Polish and Eastern European beers, and for dancin’, and for hula-hoopin’. Cool and mellow and rowdy and crazy. And the cover? Only five bucks! Show starts at 9.p.m. Hope 2 C U there! In another lifetime, three out of five of us Cow Ponies were playin’ in another band at Party on the Pavement, and WE HAD A BLAST. Great weather…great food and drink…Downtown Racine, Wisconsin…Lake Michigan…live music…running into friends…all these were definitely in play that day, and factored in to our having good memories of our show there to this day. Fast forward to September 22, 2018, when everything that happened then, right down to the great fall weather, will also be on tap this weekend, when Party on the Pavement 2018 takes to the streets of Downtown Racine. The whole shebang runs 12 to 7 p.m., with three stages of live music. 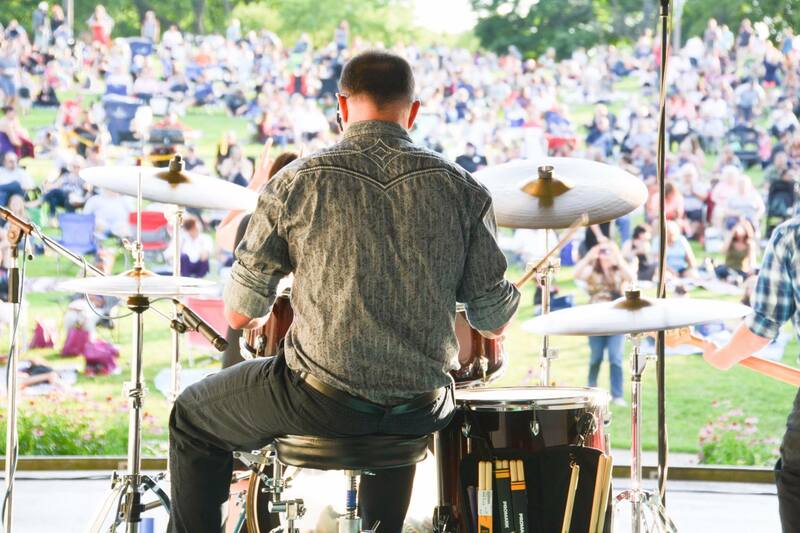 We’ll be on the Twin Disc Stage at State and Main Streets from 12 noon to 1:15 p.m.
There’ll also be games; rides; shopping; street performances; family activities; and that great food and drink that’s the hallmark of Party on the Pavement. And the best part, besides our being there: IT’S FREE! Hope 2 C U there! Get out in that beautiful fall sun with us! In honor of Harley-Davidson’s 115th Anniversary, Katancha Rock, Rally & Roll is havin’ a big-ole party at Milwaukee’s Summerfest grounds, and we’re a part of it! 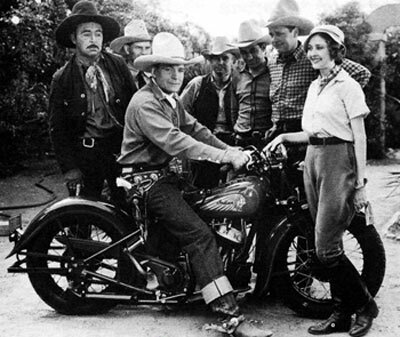 For all y’all cowboys who are early risers and have great difficulty pickin’ between yer horse and yer motorcycle, come on down to the Summerfest grounds Sat., Sept. 1, to the Katancha Rock, Rally & Roll, where The Cow Ponies’ll be playin’ from 9-11:30 a.m. at the Klements Sausage & Beer Garden stage (perfect! ).